Reference number for this case: 7-Oct-54-Cavignac. Thank you for including this reference number in any correspondence with me regarding this case. Armel Aubert, 98 years old, senior citizen of Cavignac, is impassioned by UFO observations. In fifty-seven years, he claims to have listed more than 50 extraterrestrial appearances. Armel Aubert is the senior of his commune of Cavignac. 98 years old, the man has still good feet and good eyes. This former market-gardener, widower since years, still lives in his home, continues to read and documenting homself on some topics which impassion him. He is thus set on history and archaeology. He has also another subject of study, of less academic tone, but which he approaches in a manner quite as methodical. For Armel Aubert is also a ufologist implied since 1954, the day when, for the first time, he claims to have seen weird craft. He is convinced since then of the existence of extraterrestrial life, the more so as, in fifty-seven years, he affirms to have observed about fifty phenomena. "I do not see why, in the billion planets of the universe, we would be the only inhabitants! To believe man is alone is the sign of an oversized ego and a total lack of imagination", says the 90-years-old, talking about his passion. "I saw UFOs the first time on October 7, 1954. That night, I managed to observe, from home, three luminous balls in a line, followed of sparks which appeared as the formation accelerated. The whole moved at low altitude following the railway at an ordinary speed", he tells. Armel recorded, numbered, sometimes dated at the minute and even sketched all the appearances. Looking at his file, one can read for example: "In 1974, June 18 at 5:30, I decided to go out to fish in Marsas. I see a light which moves towards Marcenais. I first believed it was a a star but the more I advanced the more the light grew bigger. A second light then detached, goes away to the right and joined another. Then the three fly away at an instantaneous speed and without noise." In November 1978 and January 1979, he believes to see nine times the same UFO. He described hos it looked. "It had a variable luminosity, the light increasing during approximately three seconds and decreased then in a similar manner. It seemed interested by the work at the nuclear power station in Braud-et-Saint-Louis. It passed at the vertical of the house, then flew in a circle above the power station. In the direction where it moved, I managed to notice two luminous glares, as if it were accompanied by two other craft." Then, "on December 1, 1999 at 04:10 p.m., I was busy sawing a branch, I look at the sky and I see a luminous ball followed by three discs of green colour. The whole moved slowly approximately 300 meters high. Besides this formation was also seen by a young man in Saint-Andre-de-Cubzac." 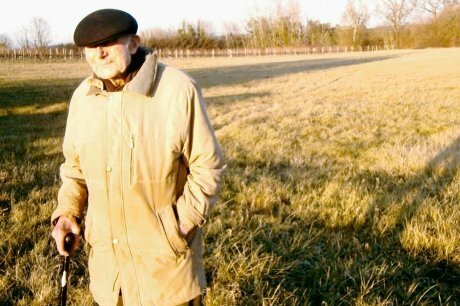 But in January 2001, this time, he observed spots of impacts on a field in Cavignac. "The craft landed for half in a field, for the other half in a vine. It must have been 14 meters in diameter. The vines were broken at a 30 centimetres height, which would tend to prove that their propulsion system is located below the disc. Since this day, the grass is still yellow at this place. I was able to note that a craft probably hovered on a 1 meter high hedge since the trees were crushed. Since then, nothing grows at this place." No clue for the moment comes to corroborate or deny his good faith. He is not an isolated case in the Gironde which counts some local ufologists, sometimes grouped together in association. Armel, on his side, read a lot on the topic of the extraterrestrials and unidentified flying objects. He appreciates both the "neutral" authors, such as Pierre Lagrange or Jacques Vallée and authors openly convinced of the extraterrestrials' existence, such as Guy Tarade or Jean-Claude Bourret, his friend he met in Libourne during a UFO conference. In France, one would count three great years in the history of UFO sightings: 1954, 1974 and finally 1990, when thousands of observations are listed. Many were identified as natural astronomical phenomena, others would resist any rational explanation... Armel, on his part, continues to watch the skies. Not looked for yet. Possible group of meteors. 1.0 Patrick Gross April 17, 2012 First published. This page was last updated on April 17, 2012.